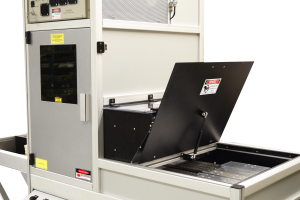 The DrillMaster™ Drill marking systemis an industrial-grade, complete turnkey laser-based system incorporating a programmable 8” Z-axis for focal height adjustments with 2 optical X’Y’ axes increasing the range of the marking area. 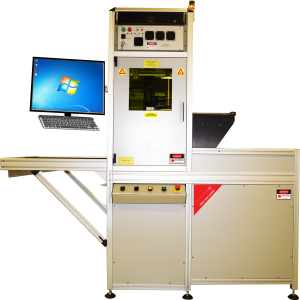 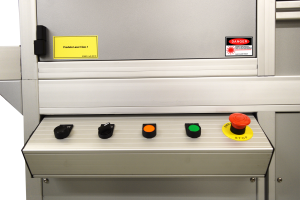 The DrillMaster™ system incorporates a movable Shuttle table/drill bit hopper, 50W Fiber Laser, Scan Head, Industrial PC Controller and Power Supply. 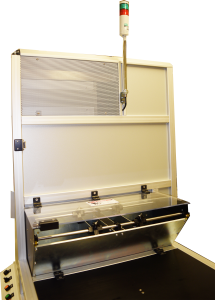 The DrillMaster™ is equipped with the latest PLC servo driver and servo motors. 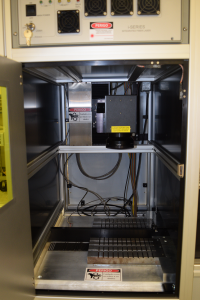 The key to the highest quality mark is the stable drill bit nest and directional shuttle table that continuously moves post laser process to ensure perfect mark quality with straight & smooth walls in unmatched cycle-times. 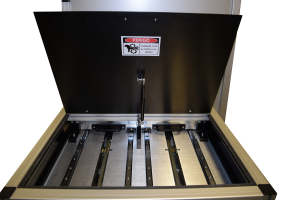 The DrillMaster™ drill marking System uses a unique combination of high energy pulses for deeper material penetration designed for high-speed removal with no re-melting of the material while performing enhanced image detailing and finesse markings.